Four engineers responsible for the creation of digital imaging sensors have been honoured with the world’s most prestigious engineering prize on 1 February 2017. The Queen Elizabeth Prize for Engineering is a £1million prize that celebrates world-changing innovations in engineering. This year’s winners have received the prestigious award for their contributions in revolutionising the way we capture and analyse visual information. 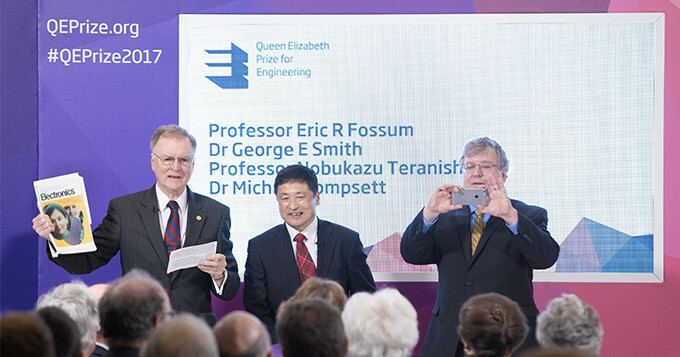 Engineers Eric Fossum (USA), George Smith (USA), Nobukazu Teranishi (Japan) and Michael Tompsett (UK) were today announced as the winners by Lord Browne of Madingley in the presence of HRH The Princess Royal at the Royal Academy of Engineering, for their combined contribution to digital imaging. The prize was awarded for three innovations spanning three decades, which have radically changed the visual world; the charge coupled device (CCD), the pinned photodiode (PPD) and the complementary metal oxide semiconductor (CMOS) image sensor. Together, this image sensor technology has transformed medical treatments, science, personal communication and entertainment. Thanks to this series of engineering innovations, today’s cameras can fit on a fingertip and are found in countless portable devices around the world.